Round shaped Mitutoyo backs are held in place with 4 screws which are not included. You can rotate the back and position it in any way convenient for your purposes. You can use the same four screws that are already on your indicator, or purchase four new ones. Different model indicators may use different screws. For that reason, we have listed them under the indicator parts lists (see page 72). These backs will fit Mitutoyo dial indicators as well as digimatic indicators with circular backs. They will not fit indicators from other manufacturers. Flat backs are used when the indicator is held by its stem and the body profile needs to be kept low. 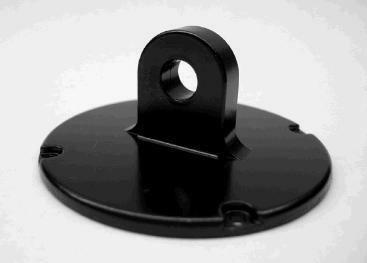 Lug backs allow you to fasten the indicator through the 1/4" hole. The lug can be located on center or off center. The only things you need to take into consideration are the size of your indicator, whether you want metric or inch configuration, and in some cases, if the indicator is the new style "S" water-proof. These models will have the letter "S" attached. Screws (you will have to refer to the parts breakdowns to determine the correct screw) then proceed to page 187 and, with luck, you will find it there. Naturally, you can use the old screws, if you haven't lost them. Other backs are available for the Mitutoyo dial indicators but we can not provide them at this time. Call Mitutoyo +1-630-978-5385 for a distributor in your area who may be able to help. You can attach a lug back directly to the back of your 1" or 2" Digimatic indicator as shown in the diagram. These indicators are considered part of Group 2. You will only have to pay attention if you have the ISO (metric) or AGD (inch) style indicators. Remove the upper four screws but do not remove the original back. 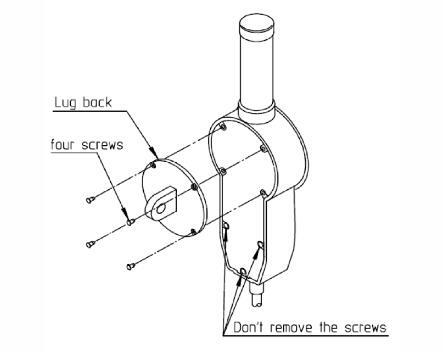 Use the same four screws to attach the lug back directly on top of the old back. How can you tell if you have the ISO or the AGD type indicator? Measure the diameter of the stem. This is the tube where the spindle moves up and down. Often times indicators are mounted by inserting this stem into a clamp, magnetic base or other holder. If the diameter is 8 mm then you have the metric ISO type indicator. If the diameter is 3/8" then you have the inch AGD type indicator. Side note: ISO represents "International Standards" while AGD represents "American Gage Design". Don't ask why we Americans didn't bother conforming to the international standards. Conforming isn't one of our strong points. Ironically, Long Island Indicator Service was involved in revamping the AGD standards in early 1960. We lobbied for the metric option but obviously failed to impress.